Google's upcoming set top box has great pedigree: It's Android-based OS, Sony and Intel are building the guts and design and Logitech doing what Logitech does best (input devices). So please, please, please don't screw this up. Right now we know very little. We know it's Android-based and will have the Chrome web browser. We don't whether it's going to be the full Chrome browser, the Webkit-based mobile browser on Android or some hybrid of the two. Roku's CEO understandably tried to pump up the potential price of a Google TV, saying that it would cost $200+ if it were entirely browser-based, like ChromeOS, compared to the $80 of his own machine. But hey, couldn't this thing cost less with Intel and Sony's scale of manufacture, and ads subsiding the entire thing? So we're left filling in the holes ourselves. Here's what we want. 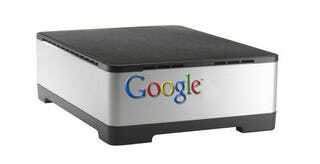 For it to be a Google set top box as people imagine it, it really needs to have access to Google's resources. That's the reason why a heavy gmail and gcal users would get an Android phone versus any other phone. • Really good YouTube support: Many devices support YouTube, like TiVo or Boxee or the PS3 (via the browser), but none are really as good as watching something on your computer, believe it or not. It's mostly down to the input device. If Logitech can make a remote/keyboard that has all the correct buttons and shortcuts for YouTube, this'll be a winner. And of course, you'd be able to buy/rent Youtube hosted hollywood movies through the device. • Gmail, Gchat (including voice and video, so this requires USB webcam support), Gmaps, Gdocs, Picasa, GReader and all the other supported apps on Android. This theoretically shouldn't be a problem, since there will be some sort of Chrome browser on board. It's just a matter of making a comfortable 10 foot interface (and keyboard, if you're going to be typing) so it's not just WebTV 2010. This is a worrying point, since Google's always done data driven design analysis, which has turned out useful, but not very slick, interfaces. • Android apps: Google has limited access to their Android Marketplace for devices that run Android (tablets, the Nook) but aren't actually Android phones. Lessen the restriction so we can get some of the 30,000 Android apps onto the platform and this'll be THE set top box. Having YouTube and a browser on your set top box is fine, but set top boxes are for TVs, aren't they? And what you really want to do on your TV is watch video, which is why Google needs to step beyond just hooking up their own products to the box and expand into other video delivery. • Media Center Extender: Being able to act as an extender to Microsoft's Windows Media Center—which lets you have access to cable TV, but without having have a fat box next to the TV with CableCARD support—would bridge internet video well with traditional broadcast video. It also means paying Microsoft money to license the tech, if Microsoft will even allow Google the privilege. But having all those features PLUS what amounts to a TiVo experience in one box would make this a must buy, assuming the price was low enough. The other, weirder, component to this rumor is that Sony wants to embed this Android set top box tech in its TVs and "appliances", which is vague and broad. TVs are obvious, since the easy way of making your TV brand more worthwhile is shoving software components that let it do much more than just be a TV. The appliances bit might be something as simple as a small LCD-based kitchen computer, or a set top box of their own, or even putting this inside their PS3. All our wishlist items stand for Sony's version too, except it also comes with an item about Sony not proprietarying it to death.